The Thermo Scientific Precision 282 Water Bath 2833 is microprocessor controlled and sturdily constructed. This laboratory water bath is a work horse with 1.5 gallon, 5.5 liter capacity and stainless steel interior. The easy to control, digital LED display located up front of this precision water bath shows the temperature display from 0ºC to 100ºC set point by just pushing a button. It’s temperature range is ambient to 99.9ºC with a temperature uniformity of ±0.2°C at 37°C and it’s temperature sensitivity is ±0.1°C at 37°C. The 2833 Precision Water Bath by Thermo Scientific is compact at 15 x 9" foot print. The Thermo Scientific Precision 282 Water Bath 2833 has an epoxy powder-coated exterior in order to avoid corrosion and chemical damage. This laboratory water bath comes with a steel gable cover to help reach temperature quickly and maintain temperature once it's reached. 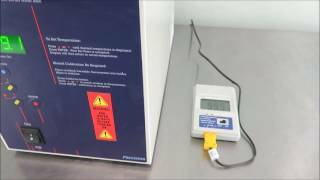 To Help eliminate thermal runaway, the Thermo Scientific water bath has an automatic over temperature protection and over-temperature safety circuitry. The Thermo Scientific Precision Water bath 2833 is UL Listed and has front mounted controls that simplify operation. Thermo Scientific is one of the reliable companies in the industry and provides numerous products that are dependable and perfect for any lab. This Thermo Precision 2833 Water Bath has been thoroughly inspected and reached its max temperature, and held it for 4 hours. All of our lab equipment comes backed with our standard warranty. Should you have any questions, please don't hesitate to reach out.